Dievole covers an area of 400 hectares within the Chianti Classico territory in Vagliagli, about 12 km north of Siena. 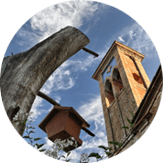 Beginning from 450 meters above sea level, the medieval hamlet where Villa Dievole is perched, overlooks the valley in which the estate slopes down to the southeast in gentle rolling hills ending at an altitude of around 300 meters. A long cypress-lined avenue leads to the heart of the estate; a stunning Tuscan panorama opens, and from there a dense network of white roads alternates with olive trees, vineyards and farmhouses. It is an unforgettable landscape in which Nature, History and Culture, together with centuries of man’s work, create a beautiful land that enchants the world. Here wine and extra virgin olive oil have been produced for nearly a thousand years, often struggling with a difficult climate. The “Chiantigiano” microclimate makes no exceptions for Dievole, where the winters are harsh and often snowy, and, after a few months of spring tranquility, are followed by hot and sunny summers. Only at the end of September does the sun turn mild and the temperatures go down; slowly the landscape turns ablaze with autumn colors. But, long ago, at Dievole the seasons and human activity achieved balance, and today the estate is a harmonious environment in which quality is found in every gesture. 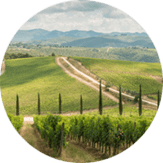 The Chianti Classico area is a land dotted with small hamlets between the cities of Florence and Siena, two genuine capitals of European culture. This is a land of ancient traditions, where man’s presence can be traced back to the Etruscans, and where even today the architecture remains respectful of its surroundings. It is also because of the love of its inhabitants that the name Chianti Classico today evokes a happy union between Nature and Mankind, between history and innovation, earth and poetry, food and good living. Famous worldwide for its many excellent products, including Chianti Classico DOCG wine and, since 2001, Chianti Classico DOP extra virgin olive oil, this area of approximately 70,000 hectares is also one of the oldest officially sanctioned production areas. Its production boundaries were laid out in 1716 by the Grand Duke of Tuscany, Cosimo III who also enacted measures regulating the production, protection, sale and naming of the wines produced here for centuries. Today, as then, its symbol is Il Gallo Nero, the Black Rooster, a reference to a legendary challenge between two rival cities.